Spring is a time of budding trees, chirping birds, and croaking frogs. Discover these and more wonders of spring in this delightful board book inspired by the works of legendary children's book author-illustrator Leo Lionni. With sturdy pages and colorful collage-style artwork, this spring-themed book is perfect for boys and girls ages 0 to 5.Spring is a time of budding trees, chirping birds, and croaking frogs. 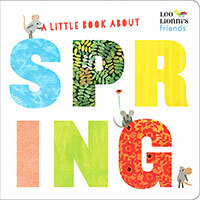 Discover these and more wonders of spring in this delightful board book inspired by the works of legendary children's book author-illustrator Leo Lionni. With sturdy pages and colorful collage-style artwork, this spring-themed book is perfect for boys and girls ages 0 to 5.